HODIE (Roman Calendar): pridie Kalendas Februarias. MYTHS and LEGENDS: The art image for today's legend shows Actaeon Attacked by His Dogs; you can also see the legends for the current week listed together here. TINY MOTTOES: Today's tiny motto is: Ut prosim (English: That I may be of use). AUDIO PROVERBS: Today's audio Latin proverb is In vestimentis non est sapientia mentis (English: Wisdom of mind is not in the clothing). To read a brief essay about this proverb and to listen to the audio, visit the Latin Via Proverbs blog. PUBLILIUS SYRUS: Today's proverb from Publilius Syrus is: Non turpis est cicatrix, quam virtus parit (English: There is no shame in a scar which was won by bravery). 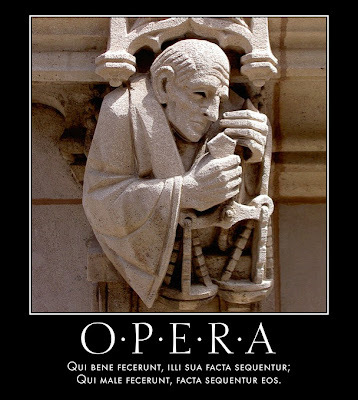 BREVISSIMA: The distich poster for today is Opera. Click here for a full-sized view; the poem has a vocabulary list and an English translation, too. FABULAE FACILES: The fable from the Fabulae Faciles widget is Vultur Convivium Faciens, the grim story of the vulture's party (this fable has a vocabulary list). 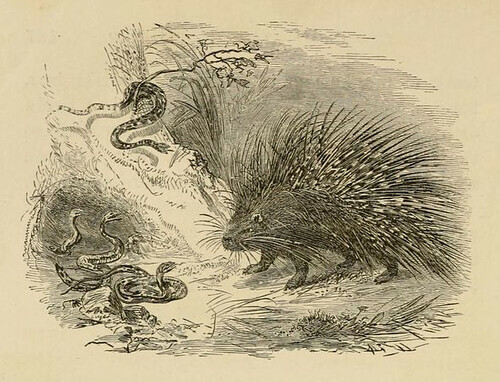 MILLE FABULAE: The fable from the Mille Fabulae et Una widget is Herinacei et Viperae, the wonderful story of the hedgehogs - who are horrible houseguests! Here is today's Proverbial LOLCat; for some observations, see the Google+ post. HODIE (Roman Calendar): ante diem quartum Kalendas Februarias. 3-WORD MOTTOES: Today's 3-word motto is Contentus vivo parvo (English: I live, content with just a little). 3-WORD PROVERBS: Today's 3-word proverb is Dicendo dicere discimus (English: We learn to speak by speaking). RHYMING PROVERBS: Today's proverb with rhyme is: Pax, pax! clamatur; sed pax per bella paratur (English: Peace! Peace! people shout, but peace is obtained through wars). VULGATE VERSES: Today's verse is Omnes vos fratres estis (Matt. 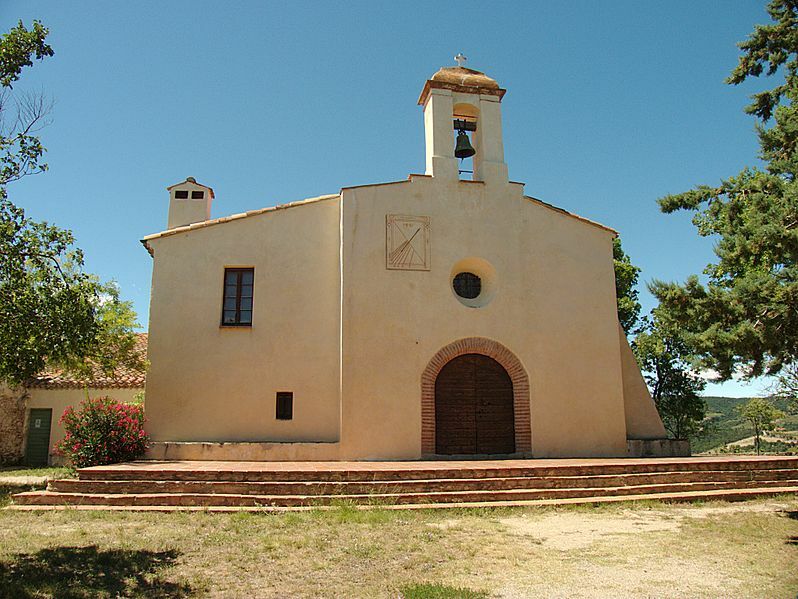 23:8). For a translation, check out the polyglot Bible, in English, Hebrew, Latin and Greek, at the Sacred Texts Archive online. ELIZABETHAN PROVERBS: Here is today's proverb commentary, this time by Conybeare: Festina lente: Make slowe haste: Soft fier maketh sweete malte. It is good to be mery and wise. This is spoken when a man will signifie a thing to be doen, neither to hastily, nor to slowlye, but in a convenient temperaunce. BREVISSIMA: The distich poster for today is Praemia Servorum. Click here for a full-sized view; the poem has a vocabulary list and an English translation, too. MILLE FABULAE: The fable from the Mille Fabulae et Una widget is Asinus et Agaso, the sad story of a stubborn donkey. 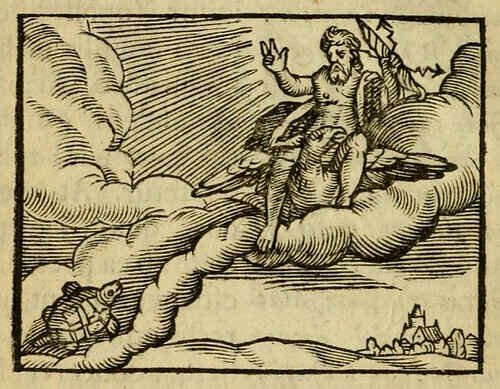 FABULAE FACILES: The fable from the Fabulae Faciles widget is Testudo et Iuppiter, the wonderful story of the turtle who was late for a wedding (this fable has a vocabulary list). 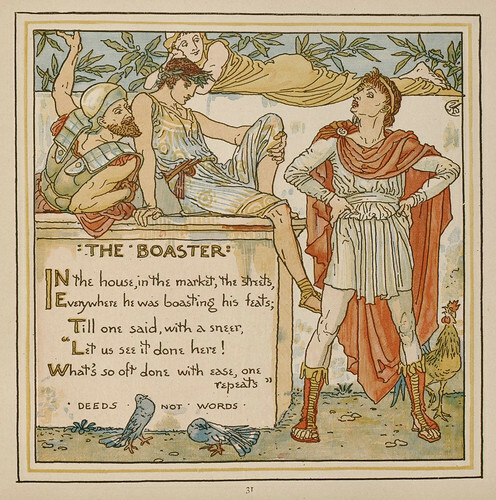 Here is a round-up of today's proverbs and fables - and for previous posts, check out the Bestiaria Latina Blog archives. If you have not downloaded a free PDF copy of Brevissima: 1001 Tiny Latin Poems, it's ready and waiting! Meanwhile, I'm slowly but surely adding poster images and English translations over at the Brevissima blog. HODIE (Roman Calendar): ante diem sextum Kalendas Februarias. 3-WORD MOTTOES: Today's 3-word verb-less motto is Facta, non verba (English: Deeds, not words). ANIMAL PROVERBS: Today's animal proverb is Ex pravo pullus bonus ovo non venit ullus (English: No good chick ever comes from a bad egg). POLYDORUS: Today's proverb from Polydorus is: Oculus domini in agro fertilissimus est (English: The eye of the master is the best fertilizer for the field). PROPER NAME PROVERBS: Today's proper name proverb from Erasmus is Amyclas perdidit silentium (English: Silence destroyed Amyclae; from Adagia 1.9.1 - supposedly the people of Amyclae had once been disturbed by false reports of an enemy invasion, so they passed a law forbidding anyone to report an invasion, which meant the town was easily captured when the enemy did arrive). GREEK PROVERBS: Today's proverb is Ἑῖς ἀνὴρ οὐ πάνθ' ὁρᾷ (English: One man cannot see all things). BREVISSIMA: The distich poster for today is Peccata Non Teguntur. Click here for a full-sized view; the poem has a vocabulary list and an English translation, too. 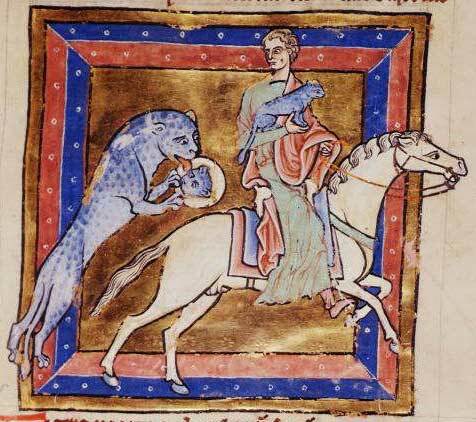 FABULAE FACILES: The fable from the Fabulae Faciles widget is Tigris et Venatores, the sad story of a mother-tiger and human hunters (this fable has a vocabulary list). MILLE FABULAE: The fable from the Mille Fabulae et Una widget is Haedus Saltans et Lupus, the story of the kid who tricked the wolf. HODIE (Roman Calendar): ante diem octavum Kalendas Februarias. TINY MOTTOES: Today's tiny motto is: Veritas superabit (English: The truth will triumph). PUBLILIUS SYRUS: Today's proverb from Publilius Syrus is: Nemo timendo ad summum pervenit locum (English: No one ever reached the top by being afraid). 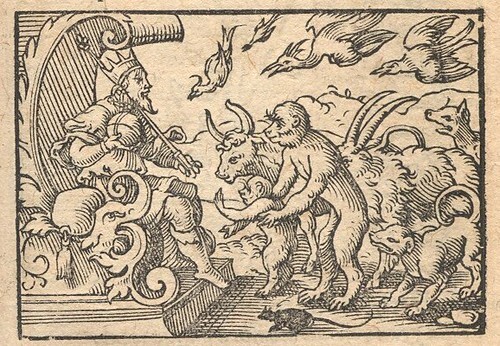 ERASMUS' ANIMALS: Today's animal proverb from Erasmus is Ovem lupo commisisti (English: You've entrusted your sheep to a wolf; from Adagia 1.4.10... which is like putting the fox in charge of the henhouse). BREVISSIMA: The distich poster for today is Malum Minus. Click here for a full-sized view; the poem has a vocabulary list and an English translation, too. MILLE FABULAE: The fable from the Mille Fabulae et Una widget is Leo et Vulpes, Socii, the sad story of an overly ambitious fox. 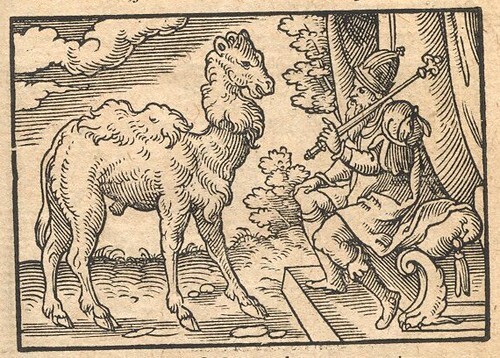 FABULAE FACILES: The fable from the Fabulae Faciles widget is Camelus et Iuppiter, the story of the foolish camel who wanted to have horns (this fable has a vocabulary list). 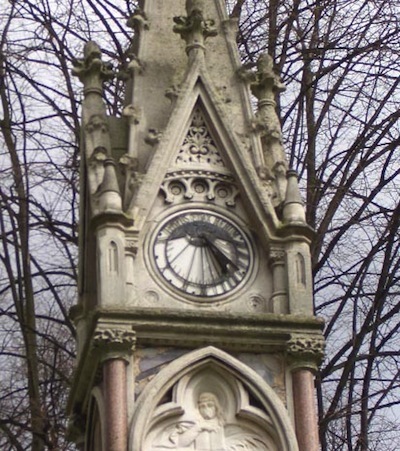 The Burdett-Coutts Memorial Sundial, erected in 1879 in the churchyard of St Pancras Old Church in London, bears the motto Tempus Edax Rerum, Time (is) the Devourer of Things. The phrase Tempus Edax Rerum isfrom Ovid's Metamorphoses; for more about the phrase in Ovid, see this post at Laudator Temporis Acti. 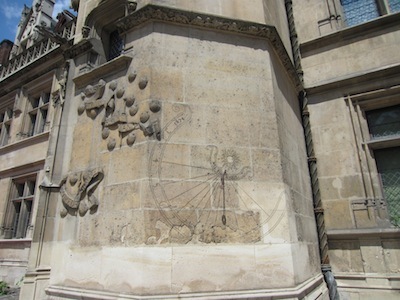 The Hôtel de Cluny in Paris features a lovely sundial with the motto Nil Sine Nobis, "Nothing Without Us." The sun with its rays is carved above the motto which makes the meaning clear: "Nothing Without Us," i.e. nothing without us, the rays of the sun. The sundial can only work when the sun is shining! 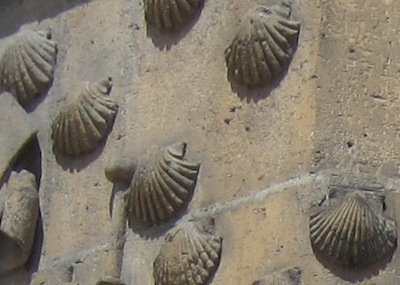 The decorative scallops which you can see allude to the pilgrimage to St. James in Compostela, whose route began near the Hôtel de Cluny. The sundial is one of the faces of the Tower; you can see some additional views at this Flickr Gallery to place the sundial in situ. Time flies. Knowledge will increase. 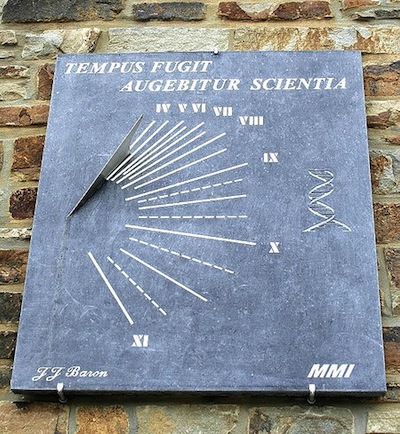 The tempus fugit motto is commonly found on sundials, but the augebitur scientia motto is not common (although Gatty does cite an example: "On the house once occupied by Cuvier at the Jardin des Plantes, Paris"). The words come from the Bible, Daniel 12:4, but the textual tradition here is very tangled. The Catholic Vulgate reads plurimi pertransibunt, et multiplex erit scientia while the Latin version of Tremellius and Junius reads percurrent multi et augebitur cognitio. 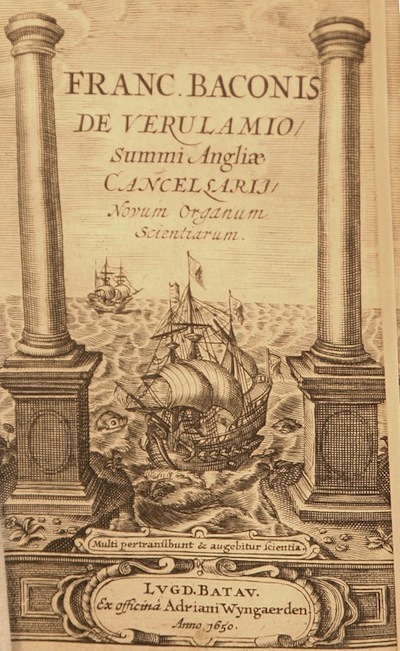 We owe the mixed augebitur scientia to the title page of Francis Bacon's Instauratio Magna of 1620 which reads: Multi pertransibunt et augebitur scientia, "Many shall pass through, and knowledge shall increase," with an image of two ships sailing on the ocean, setting out beyond the Pillars of Hercules. 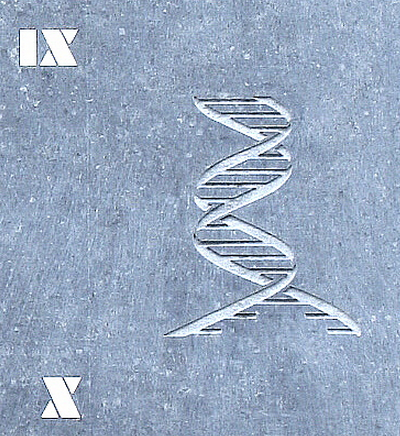 Jean-Jacques Baron, the creator of this sundial, has elegantly substituted the standard tempus fugit phrase for the first part of the motto to create something new, very appropriate for a sundial and very appropriate for science too, as symbolized the DNA double helix. I suspect Francis Bacon would approve! Here is a round-up of today's proverbs and fables - and for previous posts, check out the Bestiaria Latina Blog archives. 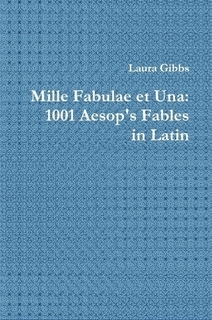 In addition to a free PDF copy of Brevissima: 1001 Tiny Latin Poems, you can also get a free PDF copy of Mille Fabulae et Una: 1001 Aesop's Fables in Latin. If you prefer the heft of a book in your hand, you can get the books in printed form from Lulu.com. HODIE (Roman Calendar): ante diem decimum Kalendas Februarias. 3-WORD MOTTOES: Today's 3-word motto is Ratio mihi sufficit (English: My powers of reason suffice me). BREVISSIMA: The distich poster for today is Hominis Crimina. Click here for a full-sized view; the poem has a vocabulary list and an English translation, too. FABULAE FACILES: The fable from the Fabulae Faciles widget is Canis Vetulus et Magister, the story of the old dog and his ungrateful master (this fable has a vocabulary list). MILLE FABULAE: The fable from the Mille Fabulae et Una widget is Iactator in Patriam Reversus, the story of the boasting athlete. 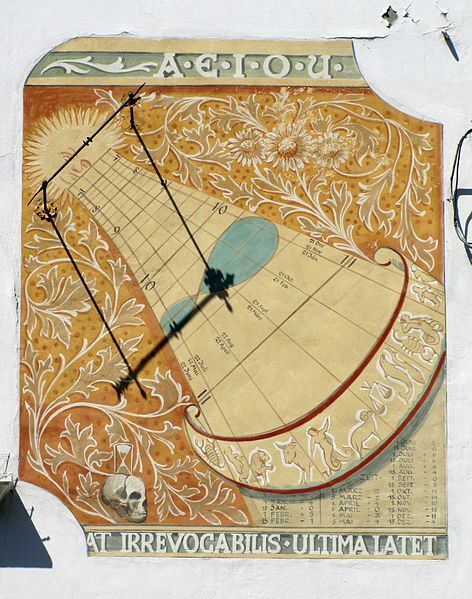 I chose to write about this sundial because I was looking for another one that has zodiac images, and of course I was delighted to find out that this is a sundial in Poland! I cannot remember actually seeing this sundial when I spent a summer in Kraków, but I certainly visited the Mariacki Church, a beautiful building which is on the city's main square. The sundial was installed in 1954 and is the work of Tadeusz Przypkowski, whose sundials can be seen in many other European cities, as well as at the Royal Observatory in Greenwich! Dies nostri quasi umbra super terram et nulla est mora. 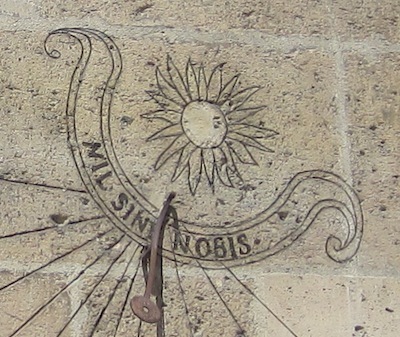 What an apt motto for a sundial where the shadow moves ever onward without delay! 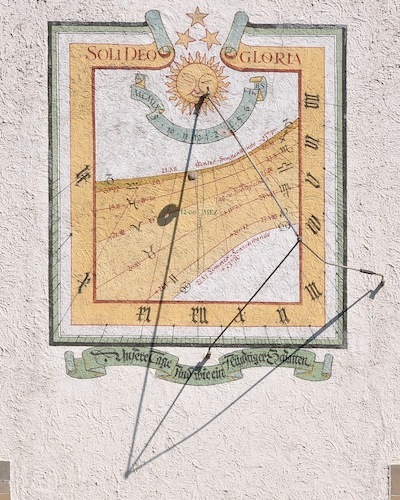 I found this image at Wikimedia Commons (thanks to Rj1979), and I also found a wonderful photo gallery, including historical photographs from the time of the sundial's installation, at the Gnomonika website. 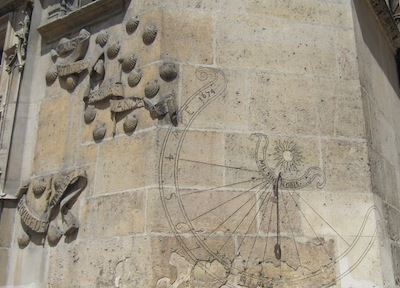 Here is the sundial, and the zodiac symbols can be seen up and down to the left and the right; click here for a larger image that shows the zodiac signs in detail. In the upper left, there is also this elegant depiction of the name MARYA (Mary) surrounded by twelve stars, an allusion to the opening words of Revelation 12: Et signum magnum apparuit in caelo: mulier amicta sole, et luna sub pedibus eius, et in capite eius corona stellarum duodecim, "And there appeared a great wonder in heaven: a woman clothed with the sun, and the moon under her feet, and upon her head a crown of twelve stars." 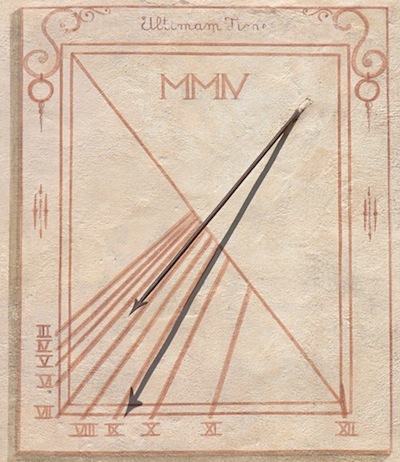 I found this lovely sundial at Wikimedia Commons, thanks to Roland ZH. It is at the Reformierte Kirche in Eglisau (not far from Zurich) in Switzerland. The Latin words mean "(To) God Alone (is the) Glory." The Latin phrase is of great importance in the history of Christianity; you can learn more about that in this Wikipedia article: Soli Deo Gloria. The word for "alone" in Latin here is soli, which is the dative form of the adjective solus. This creates a wonderful pun on the word for sun, which is sol in Latin, soli in the dative. So, in addition to meaning "To God Alone is the Glory," the Latin phrase also means "To God, the Sun, is the Glory." For another sundial with this same Latin motto, see this beautiful image at the British Museum: 19th-century ivory diptych dial (see the motto on the lower dial). See also this diptych dial at the Royal Museums Greenwich. 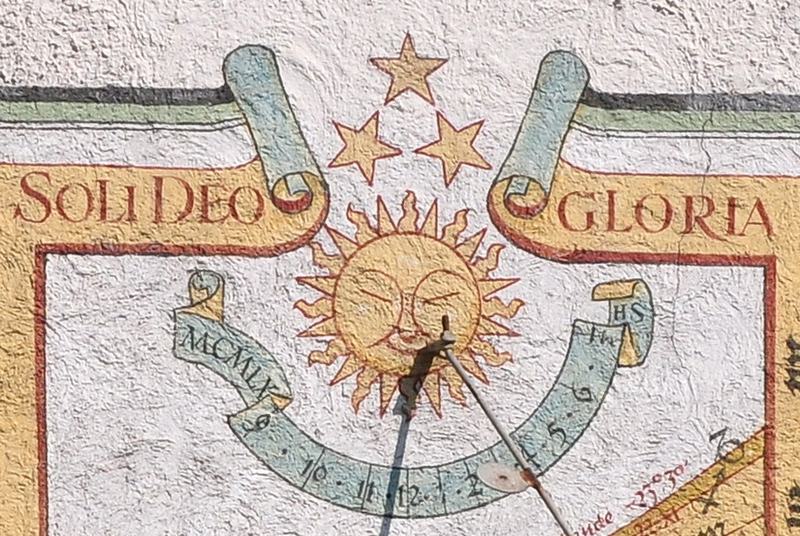 Meanwhile, this Swiss sundial has a German inscription on a banner which I cannot read; if anybody can help me with this, that would be super! You can see a more detailed view here. HODIE (Roman Calendar): ante diem duodecimum Kalendas Februarias. ANIMAL PROVERBS: Today's animal proverb is Leo a leporibus insultatur mortuus (English: A lion, after he's dead, is mocked by the rabbits). POLYDORUS: Today's proverb from Polydorus is: Qui ipse sibi sapiens prodesse nequit, nequicquam sapit (English: The wise man who does not know how to help himself is wise in vain). GREEK PROVERBS: Today's proverb is Ἀνδρὶ σοφῷ πᾶσα γῆ βατή (English: For the wise man, the whole world is walkable). BREVISSIMA: The distich poster for today is Nocitura. Click here for a full-sized view; the poem has a vocabulary list and an English translation, too. MILLE FABULAE: The fable from the Mille Fabulae et Una widget is Satyrus et Viator, the story of the satyr and his guest. FABULAE FACILES: The fable from the Fabulae Faciles widget is Simia et Catuli Eius, the story about the monkey mother and the animal beauty pageant (this fable has a vocabulary list). This sundial is located in Meran, a city in the South Tyrol (Alto Adige in Italian), which is an autonomous province of northern Italy. At the top of the sundial there is an inscription that reads: A·E·I·O·U, which stands for Austriae Est Imperare Orbi Universo, It is for Austria to rule the whole world (for other Latin interpretations of the acronym, see this Wikipedia article: AEIOU). Without the verb volat, the motto simply does not make sense because the adjective "not to be called back" does not fit with hiding. 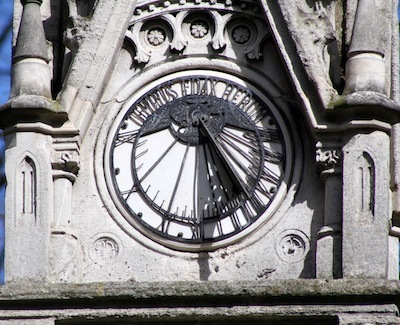 What we have here are two different Latin cliches about time. On the one hand, time is something that flies, something that runs away and will not come back to you no matter how desperately you might call (hora irrevocabilis). Meanwhile, as the present is slipping away irrevocably into the past, the future is unknown, something that is hidden from our knowledge (latet). 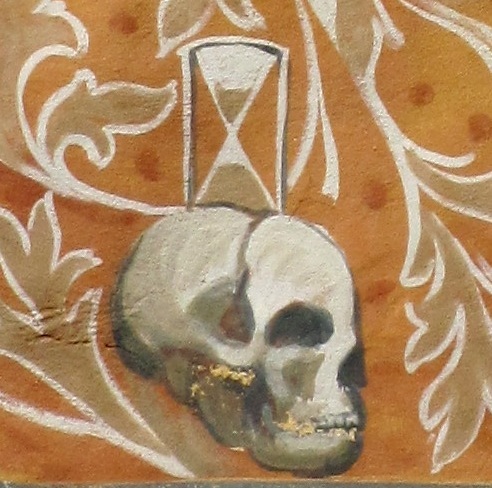 Moreover, just above the motto there is a skull together with an hourglass, again reinforcing the two-part interpretation of the motto: the hourglass with sand running through it shows the movement of time (volat irrevocabilis), while the skull is a "memento mori" of our final hour which is certain to come but which is hidden until it does arrive (ultima latet). 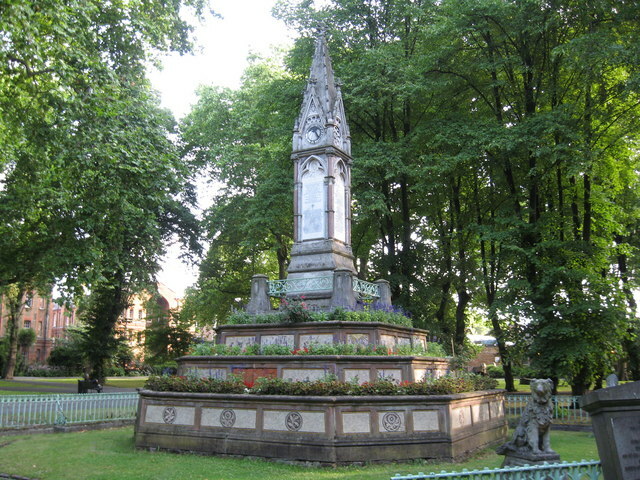 Note that there has been an erasure in the upper right-hand corner also, but it is only a decorative element that has been covered over, not part of the inscription itself. Still, the symmetry of the top line shows clearly that a decorative element is missing in the upper right-hand corner, just as there are letters missing in the lower left-hand corner. So, given the clear evidence for a reading of VOLAT, I am very surprised not to find this interpretation provided somewhere online. Instead, I see repeated on many webpages the incorrect and incomplete transcription with AT, which is then accompanied by a nonsensical English translation that results from the incorrect transcription. Presumably the main source for this repeated error is the Wikimedia webpage which I have used for the source of this image; it features the incorrect transcription and this English translation: "But the last [hour] is hidden, not to be recalled." If anyone has reason to think I am wrong about this, please let me know! Meanwhile, the entire presentation is quite beautiful, as you can see in the image below. 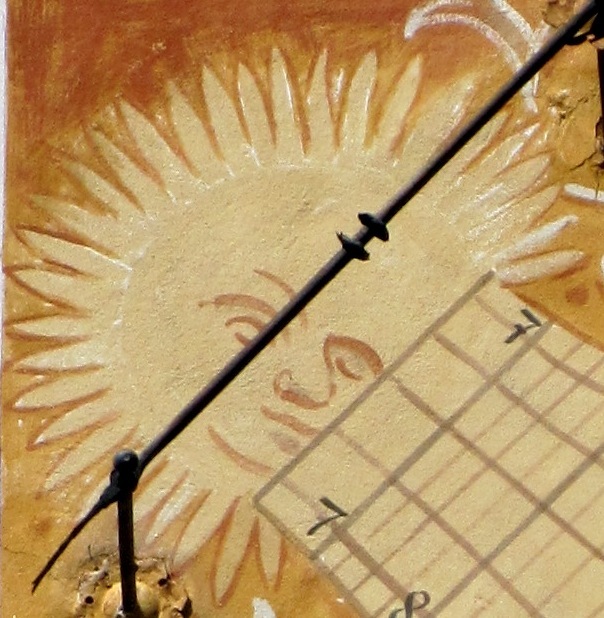 There is a sun with a face beaming down from the left-hand corner, and the signs of the zodiac at the bottom. Lovely!